WELCOME TO HISTORY OF BURCH MANUFACTURING CO. 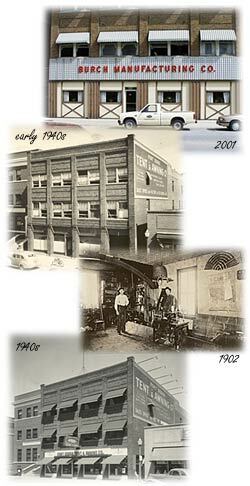 Since 1882 , we are still a family owned business and now with the 4th and 5th Generations. We have expanded from the once tiny operation set up in a basement to repair covered wagons, to a multifaceted manufacturing firm with international distributions of many of its products. Over 125 year period , Burch has undergone changes in name from Ft. Dodge Tent and Awning to Burch Mfg. Co. Inc., locations, Men to Women Presidents, products lines, and productions techniques. One thing has remained constant, however: It's ownership and management has been in the Burch family since it was started. The family's high standards for quality and dependability have gained the company a well deserved reputation over the years. The war years, between 1942 and 1945 proved to be a lucrative time for the firm, since a large amount of government work was undertaken, predominantly the manufacturing of officer and squad tents. In 1945, the Heat Houser, a canvas accessory for tractors that channels heat from the engine back to the person operating the tractor. In 1953, a line of Heat-Houser for Industrial construction equipment was added. In 1970's a line of portable water tanks. The Kolaps-A-Tanks were developed. FDA Models are for storing water for human consumption, Fire FK Models are for Fire Departments where water is not readily accessible. DB85 Model is ideal for on site use at Hazardous Incidents. We also manufacture specialty items and made to order products for customers all over the country. We would be more then happy to quote you on any of your projects. We value our customers opinions so E-mail us at burchmfg@frontiernet.net, Phone 515-573-4136 or Fax 515-573-4138. The 4th and 5th Generation of the Burch family are here to carry on the tradition of quality and service. The 6th Generations are sweeping the floors just like we all did. We started from the bottom and worked our way to the top of the company.